← Italia – If Snooki Can do it, So Can I! Two years ago, as I was leaving California for Vancouver, my friend Erin was heading to Malawi to visit her boyfriend and plan her own move out of the Golden State. I promised her then and there that I would somehow make it to Malawi to visit her. Since then, they have gotten married, made a home in Africa, and done some incredible work. I was extremely excited to see them and to do whatever I could to contribute to their efforts in Malawi, as well as celebrate Christmas with familiar faces. My flight from Rome to Lilongwe included a stop in London, Addis Ababa, and the Democratic Republic of the Congo…not a short journey but well worth it! I arrived with Erin’s friend James, who was also visiting and we headed straight from the airport to the bus depot for the 4.5 hour journey to Machinga Boma. When we got the the depot, there was only one bus heading that way, and it was almost empty. As in a number of places I have been, the busses here don’t really run on a schedule, they leave when they are full. So, we hung out in the bus for about 3 hours chatting and doing some great people watching before getting on the road. Poor James is a very tall man and this bus was not designed with much space. This became a bit of a theme for his visit…squishing into small spaces on public transport while the locals giggled about these funny azungu (westerners). We made it to the house (after an interesting ride from the bus up the hill, another story for another time) around midnight and immeadiately crashed into bed, tucked in our mosquito nets and slept like rocks. The next morning, we relaxed on the porch trying to wrap our heads around the astounding view of the valley and watching the monkeys stealing mangos from the trees in the yard. What a surreal change from Europe! That evening, we heard the sound of drumming from down the hill. It seemed to be getting closer and sure enough, up came Jordan with a group of Malawians who put on a drum and fire show to welcome James and I. It was incredible! In the following days, we went to Cape Mclear on Lake Malawi (the 3rd largest lake in Africa, and felt very much like I was back on the beaches of Thailand) and headed to Liwonde National Park to meet Jordan at Mvuu camp, where he and Erin also live. Heading to the lake was exciting for a number of reasons, not the least of which was to escape the heat (on a few occasions, I was pretty sure my skin was melting…haha, I’m so dramatic). On the way to the lake, we were stranded at a turn off in the road for a while, but were resuced by one of the coolest rides I have ever taken; we rode on the bumper of a red jeep on the back of a flatbed truck. Winding and weaving our way through the woods to the lake made me more then just a little giddy. While there, we stopped by Otter Point where the crystal clear water and rolling white rocks are made even more impressive by the aquarium effect created by the tropical rainbow coloured fish everywhere. But the time came to bail on the lake and head out to see Jordan. To get to the camp, we had to take bike taxis along 16km of dirt road, followed by a tin boat ride across the river. 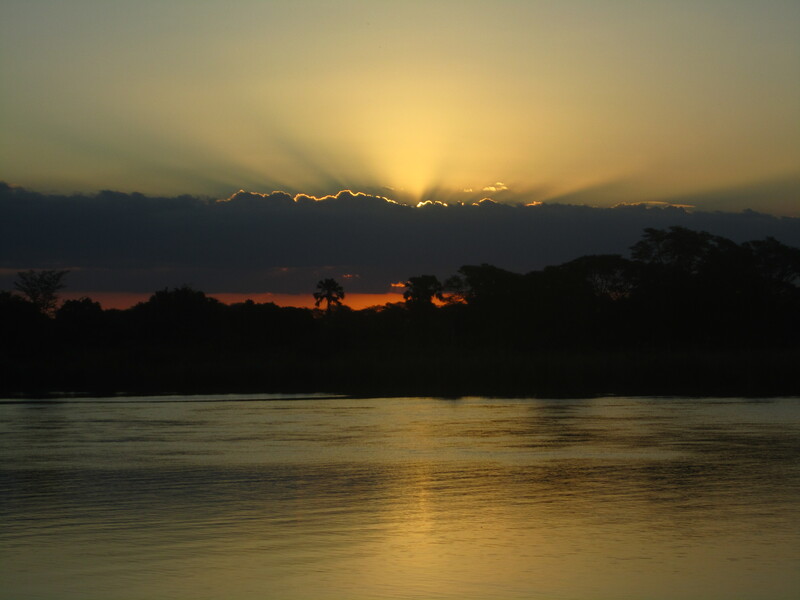 On this trip, we saw baboons, hippos, antelope, eagles, warthogs, and crocodiles without even having to look for them! I knew right away that this was going to be an epic experience. While at the camp, we were able to head into the Black Rhino Sanctuary on Safari. There are only 4000 Black Rhinos left in the world and 13 of them are in Liwonde National Park. 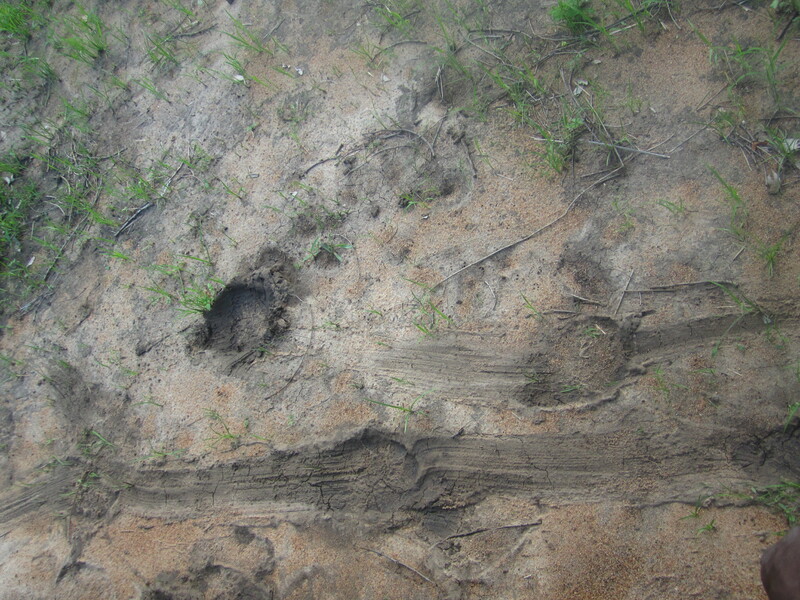 We didn’t get to see a Rhino, but we saw his tracks and we close enough to smell him (he smelled even worse than I did!). However, we did get to see a ton of other animals including Zebras, Buffalos, Impalas, Kudus, Sables, Eagles (and so many other birds it was crazy), Elephants, Squirrels, Hartebeest, and even a turtle! As we were leaving, James spoted a python crossing the path in front of us, jumped out of the vehicle and picked it up! I couldn’t believe it! I also learned about sundowners; drinks enjoyed while watching the sunset. This is definitely something I will start doing at home! Another part of being at the camp was getting to see Erin and Jordan in action. We visited the schools their organization supports, the orphan care center, the health center and maternity ward they built and got to meet more people then I could possibly ever remember. While we were at the schools, and also while we were riding through the villages, the children kept running up to us to greet us. Jordan had taught many of them to say “No Poaching! Buy Curios!” instead of asking for money. It was incredible funny to hear this as we cruised through on bike taxis. Soon, James had to head home, but a few days later Erin’s sister arrived. She was supposed to come in on Christmas day, but her flight was delayed and she ended up spending Christmas in Ethopia, which she dealt with like a champ! We were already in the Capital to meet her, so we enjoyed an extremely delicious Christmas Eve meal (seriously…4 courses!!! Heaven!) and then hung out until she got in on Boxing Day. It was awesome getting to watch the sister reunion, but at the same time it made me think of the day I will reunite with my family and how much I wish I could have been with them for Christmas (without ending my trip of course). But, I was in Africa and this was no time to pout! We got back on the bus and headed back to Machinga to celebrate. After decorating the livingroom and putting up the tree, we opened presents then headed to the lawn to kick back and sip wine while the sun set. 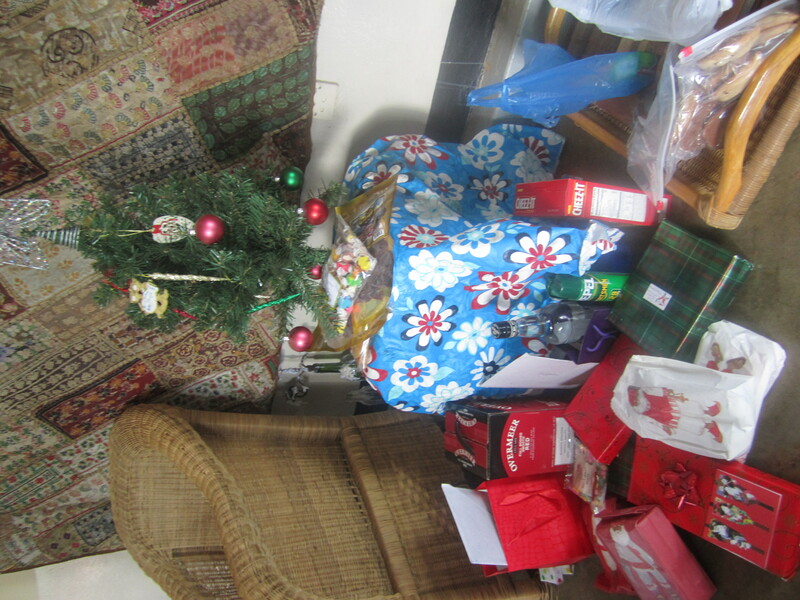 There may not have been snow or family of my own, but I was surround by warmth and happiness and will always remember my Malawi Christmas. Our next big venture was to head back to Cape Mclear to celebrate New Years. We teamed up with Erin’s friend Dawn and headed back to the lake. Here a weird little competition started to see who could manage to celebrate NYE the best and stay up the longest. I managed to dance my way to 5:30, rolling through the first few hours of 2012 laughing and even hanging out with some South Africa smurfs, but when it started to rain, I decided it was time to make use of one of the last available beds in town for a few hours. I woke up around 8:30, found Erin and Jordan and headed back to try to locate some pizza. There, we found Trina and Dawn still going strong. I had no chance of winning that one! Erin, Jordan and Trina headed off to Otter Point, and Dawn and I hung out with some others on the beach. 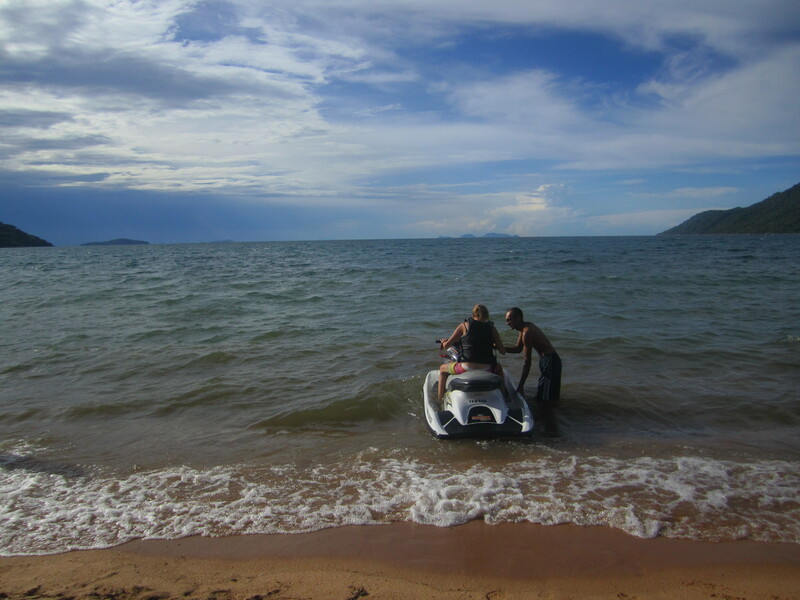 Great decision…I managed to get into the lake and have my first ever JetSki experience. It turns out that I am a bit of a natural, and if anyone wants to buy me a JetSki I promise to prove it to you. From the lake, we again headed to the camp. 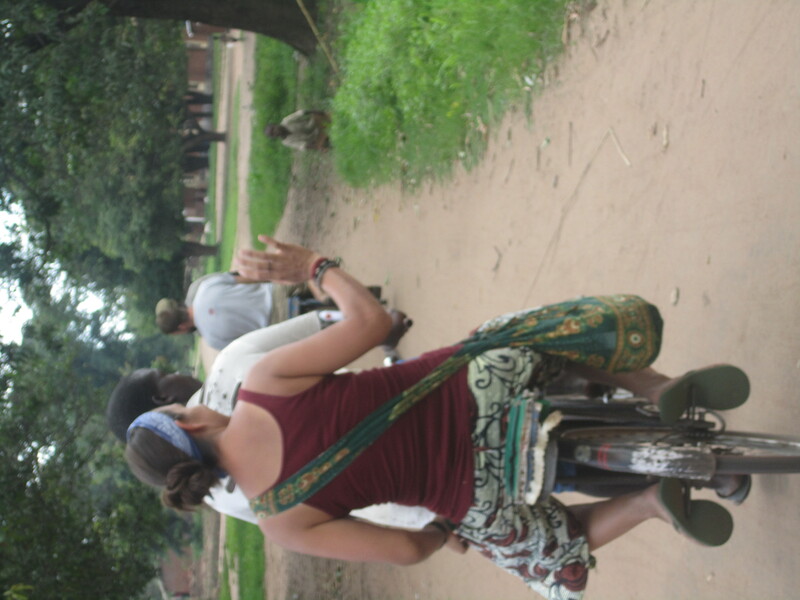 We were once again riding through the villages on the back of bikes, visiting the kids and spotting incredible wildlife. 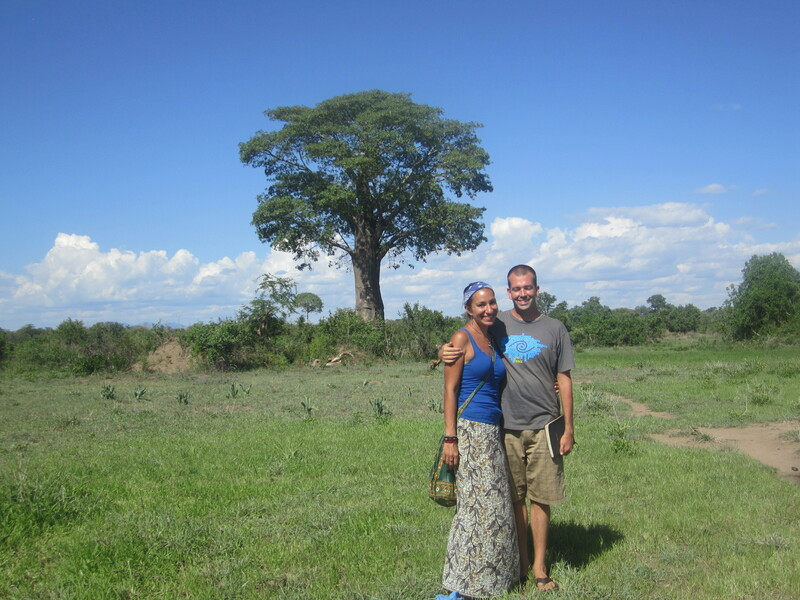 A few days later, we came to Trina’s last day in Malawi. Jordan arranged to have the fire-breathing band come and meet us at the school for an epic good-bye party. The only problem is that in order to have a fire show, it has to be dark out. The general rule was that no one could enter the park after dark because the chance of encounters with animals of the deadly kind are too dangerous. We got to the park gates and it started raining. The manager of the park arranged for us to have armed guards walk us to the dock where we could get the tin boat to the camp. We were instructed to stay completely quiet and walk in sigle file. The rain got harder and the lightening started. This had to be the longest walk of my life and the whole way I just kept thinking “I have had an awesome life, it’s not so bad if this is how it has to end”. Somehow, we made it to the dock and loaded into the tin boat. Keep in mind that this is in the middle of a lightening storm. I may have been a little tense at this point. We got halfway across the river (full of crocodiles) when something moved on my seat. I noticed that Trina and Erin were watching me, so I turned around and saw a big rat crawling on my seat. Without thinking I jumped up, but to the horror of Jordan who instantly yelled “Sit down, we are on a boat!”. I was soooo happy to crawl under my mosquito net that night and close my eyes against the memory of that commute. Early the next morning, Erin and Trina headed off to the capital. It was really sad to see Trina head back home, and again I felt a little envy thinking that if I were heading home, I could have my own family reunion. 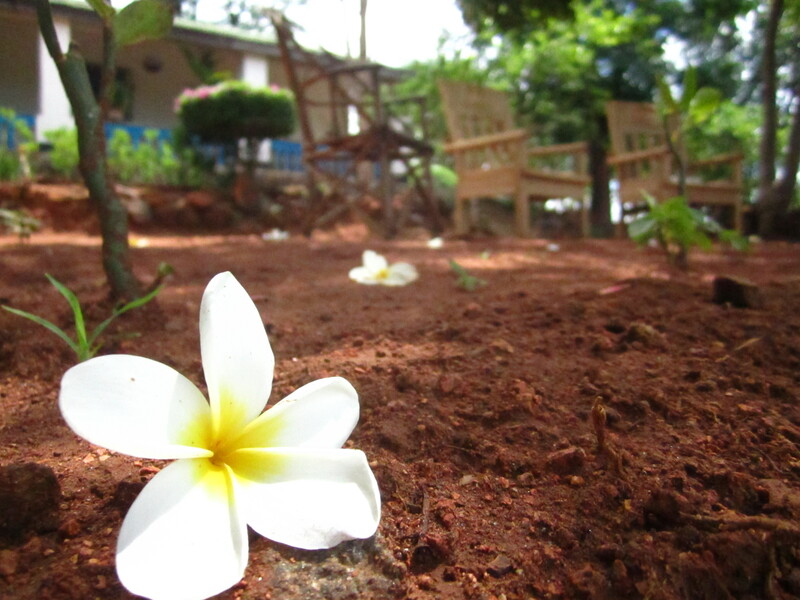 That didn’t last long though, because that day I travelled back to Machinga on my own. For some reason, even after all the crazy situations I have been in over the last year, I was nervous to travel alone in Malawi. After the trip back to the house, I felt like I was back on top of the world. I could do anything! Appearently, it doesn’t take much to impress me. Ok, I think that is enough rambling for now, more to come soon (I know I have said that before, but this time I promise is wont take a month)!!! 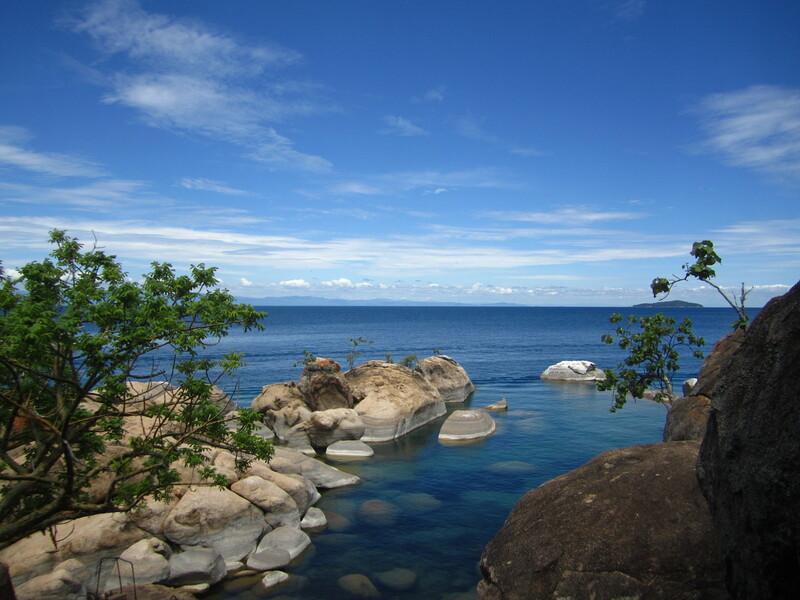 I am so glad your life didnt end in Malawi although it looks beautiful there. The kids look healthy. 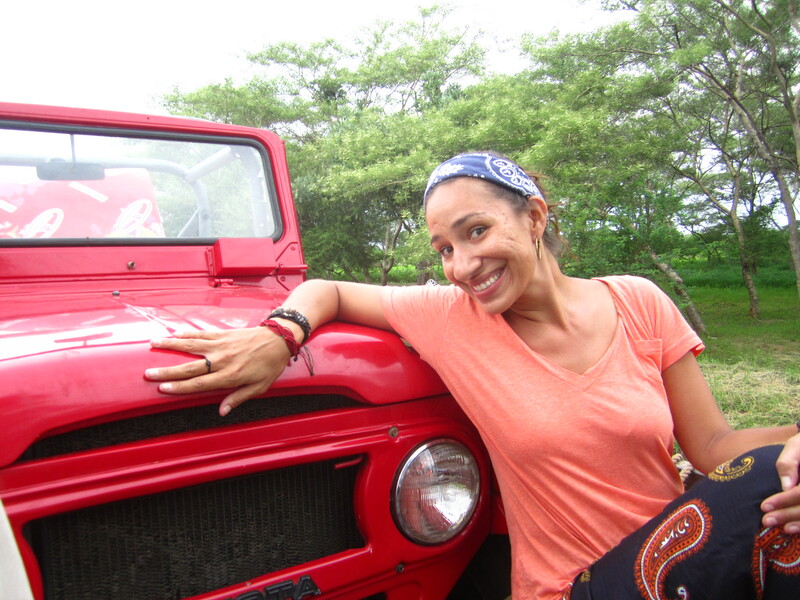 Stay safe and we’ll see you soon and hear more of your adventures….Love you! a rat, in the dark, in the rain, in a tin boat. phew – you are a survivor!!! love your christmas tree and really love the idea of that sundowner you’re bringing home with you. I love that I got to hear the Malawi stories and see the pics in person during our Spain trip! Miss you! Umm, South African smurfs? Am I the only one who read that? lol tell us more! Also – gasped with my hand over my mouth at the thought of the rat – gimme a crocodile any day over a rat (I say safe in my little apartment)!